Young or Old, Invisalign from Your Dentist in Virginia Beach Works! Every morning you wake up to brush your teeth and you’re greeted with the same set of crooked teeth. As you go to brush, you hear your teenager from the other room groaning in the bathroom. The door’s open, so you pop in and ask if they’re okay. “I hate my teeth.” They say to you. Seems like the apple doesn’t fall far from the tree in this case; your child has crooked teeth as well. 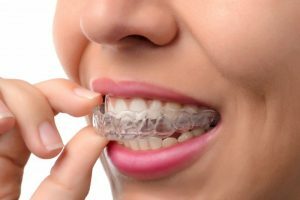 Instead of settling for crooked teeth and a poor bite, why not consider Invisalign from your dentist in Virginia Beach? There are many benefits, regardless of your age. When it comes to age, Invisalign treatment is incredibly effective for teens mainly because their teeth are still growing. This means they are more susceptible to orthodontic intervention than teeth that are fully grown. With clear aligners, your teen doesn’t have to change their diet or brushing habits to obtain straighter and healthier teeth. Furthermore, adults are also ideal candidates for Invisalign in Virginia Beach, especially if they’ve had traditional braces before. In fact, many adults pursue Invisalign treatment because they didn’t wear their retainer often enough. This caused their teeth to slowly shift back to their previously crooked position. Regardless of your age, you’ll be glad you took care of your dental issues now that you have the chance. While fixing misalignment in the mouth is a great way to make your smile more aesthetically pleasing, it’s not Invisalign’s only purpose. When teeth are no longer crooked, it improves the bite of patients significantly. The better the bite, the less likely you are to experience problems related to the temporomandibular joint. When a patient suffers from any form of malocclusion, it affects the way that force is distributed in their mouth. Basic functions, like chewing, can be negatively affected when a bite is not aligned properly. Therefore, people with bad bites are more likely to experience symptoms associated with temporomandibular joint disorder (i.e. jaw pain and headaches), so fixing your bite can make a huge difference. Many adults avoid pursuing orthodontic treatment because they’ve already established an image that they want to retain. Since aligners from Invisalign are transparent, you can now seek the treatment you wouldn’t otherwise and still maintain the image you’ve built for yourself. The next time you and your teen go to brush your teeth, all you need to do is remove the clear aligners, resume your regular brushing routine, then pop them back in. Treating misalignment and bite problems couldn’t be easier! Not sure if Invisalign is right for you? Schedule an appointment with your dentist in Virginia Beach today to learn more! Dr. Stephanie L. Santos earned her Doctor of Dental Surgery degree from the Virginia Commonwealth University before completing her Advanced Education in General Residency. Since then, she’s become a member of the ADA and the Spears Education Center Study Club. To learn more about Invisalign treatment or her practice, contact her at (757) 499-9639 or visit her website. Comments Off on Young or Old, Invisalign from Your Dentist in Virginia Beach Works!